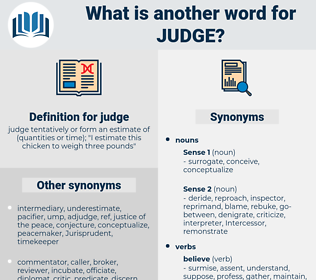 What is another word for judge? judge tentatively or form an estimate of ( quantities or time); " I estimate this chicken to weigh three pounds"
putting on one thinking cap. AM, deem, consider, determine, determining. deem, consider, Considering, Estimating, convict, determine, determining, prosecute. 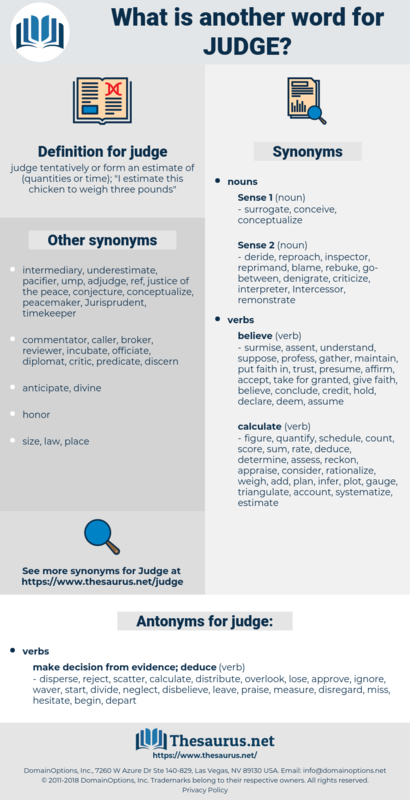 judges, magistrates, justice, justices, court, qadi. judicature, justice, assess, arbiter, court, trier, Deathblow, prosecution. evaluating, Assessed, assesses, gauge, assess, appraise, condemn. disperse, reject, scatter, calculate, distribute, overlook, lose, approve, ignore, waver, start, divide, neglect, disbelieve, leave, praise, measure, disregard, miss, hesitate, begin, depart. I can't judge of him. I would think and judge and feel as the one, my Master. justiciar, chief justice, doge, qadi, daniel, trier, praetor, trial judge, justiciary, ordinary, pretor, Alcalde, magistrate, recorder.